Once again the home team wins by double digits. I hear many say that the regular season is too long and doesn’t matter, but when you can’t win a playoff game on the road, It Does Matter!!! Lebron = 4/11 FG 36% 4 Turnovers......ZERO assists. LeBron = TWO points and TWO turnovers is the last 16 mintes of the game. HUGE adjustments from Celtics so LeBron couldn’t isolate or backdown Rozier on switches! The Rockets ONLY played SEVEN players Thursday night. Harden was terrible with the ball!!! CP3 got hurt at the end. Golden State had four all-stars, 3 MVP awards and 2 Defensive Player Of The Year awards and couldn’t beat the Rockets!!! The Rockets win despite James Harden going 0-for-11 from 3. Harden matches John Starks in Game 7 of the 1994 NBA Finals (0-11) for the most 3-point attempts without a make in playoffs history. The Rockets' seven players are committed to not letting the Warriors get to the basket......brilliant 7-man rotation adjustment by D’Antoni......down to 6-man rotation once Chris Paul got hurt. Chris Paul didn’t meet with Media following the game. Rockets confirmed it’s his hamstring, will update tomorrow at practice. Can the Rockets survive if Chris Paul misses time......Houston has a positive points differential this series when Harden is on the court and Paul is off the court!!! Steph Curry on Chris Paul's shimmy: "It was well deserved. It was a tough shot. If you can shimmy on somebody else, you've got to be all right getting shimmied on. So I'll keep shimmying and maybe he will as well." Mike D’Antoni said Eric Gordon will move to the role of playmaker if Chris Paul doesn’t return from a hamstring injury in Game 6. Can James Harden play that badly again??? I think there’s a possibility James has an All-Time EPIC game! Can Kevin Durant play as badly? Do The Rockets Want It More??? Houston had a 10 point lead on the road with a 3-2 Series......ONLY score 9 4thQ points, total of 25 in the second half. 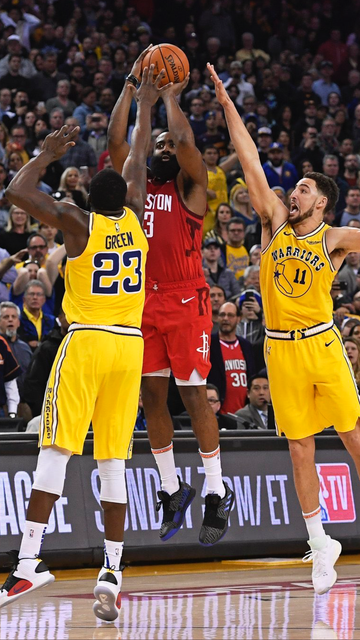 Warriors held the Rockets to 25 points in the second half and nine points in the fourth quarter, setting franchise playoff records for fewest points allowed in a half & quarter. How much did the Rockets miss Paul?? Rockets had 26 assist opportunities in Game 6, their fewest in a postseason game this year. Paul was averaging 12 per game this series. PJ TUCKER - "Obviously we didn't want to play a game 7, but we've got the opportunity to close out the series." D’Antoni on his guys getting tired: “I’m sure they did but so did (the Warriors). It’s the playoffs. Some guys are going to get tired but we’re going to have to fight through. Mike D'Antoni cutting the rotation to 7 guys has been drastically more of an advantage than disadvantage. Mike D'Antoni on Chris Paul possibly coming back for Game 7: "I have no idea." James Harden had ZERO free throws in the second half. Steve Kerr: “I thought Nick Young did a great job defensively” which, yeah, we’re in 2018. 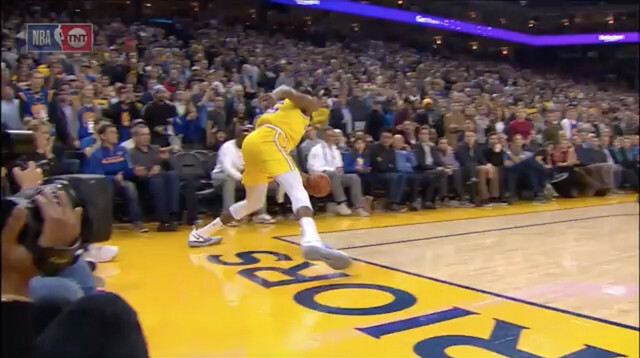 Draymond Green only called for ONE foul......hilarious. Draymond Green is the first player in NBA history with at least 9 assists, 5 blocks and 4 steals in a playoff game. James Harden:"There's no pressure. It's an opportunity, an opportunity that we all are excited to be a part of. Game 7 at our house, that's what we've worked the entire regular season for to get home-court advantage. So we're going to come out and be ready." Boston made only 7 of 39 three-point attempts, including 10 missed 3’s in the 4thQ. LeBron James has won 6 straight Game 7’s. LeBron won a road game in 32 of last 33 series. He will play in his 9th Finals. This is perhaps the greatest Eastern Conference win of his career......especially when you consider Kevin Love missing the last two games due to concussion protocol. LeBron has made the finals every year since ”the decision"...so it didn't ruin his career like many......? ? ? ? The Cavs’ second leading scorer last night was Jeff Green. A dude on a minimum contract. Despite the roster around him, the East still can’t beat LeBron 4 times in a 7-game series. LeBron played all 48 minutes in his 100th game of the season in his 15th year and went 34-15-9 without Kevin Love in Game 7, and is in his eighth straight finals.. Rockets send: Patrick Beverly, Lou Williams, Sam Decker and a 2018 pick to the LA Clippers in the Sign-&-Trade deal. I posted the above one year ago today. Tonight, CP3 has the opportunity to play in the biggest game of his carrier and I believe he and his hammy will give it a go. Home teams in Game 7s are 104-26 (.800) all-time. Defending champs are 8-0 in Conference Finals Game 7s since the NBA began seeding in 1984. 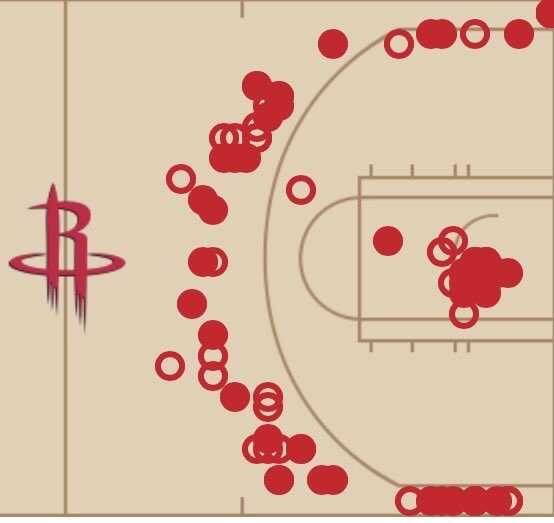 The Rockets had 11 offensive rebounds at the first half......after not having more than 10 in a game prior this series.. Houston's team high for offensive boards in these playoffs is 12 in Game 2 of the First Round series vs. Minnesota. After 1stQ: Steve Kerr - “One of theWorst quarters we've ever played"
For the most part, Houston was having their way with Golden State during the 2ndQ.......NOT ONE GSW outscored Clint Capela in the first half. Rockets led 54-43 at halftime. At one point, 25 straight misses from THREE is really unbelievable!!! When the Rockets have missed their last 25 triples. If they make 5, they’re up FIVE!!! Kevin Durant: “We knew at some point they’d tire out. James dribbled so much each possession, I know at some point he’ll wear down and we were going at him on the defensive side of the ball as well"
Eric Gordon: on Chris Paul's absence: "If he was out there, we would be playing on Thursday." Harden - "One half of basketball. ... It's extremely frustrating." Kevin Durant on whether Rockets are close to catching the Warriors: "Anything could happen over the summer, for both sides." Ok so let me see if my analytics are right. Houston shot 44 3’s, made 7 3’s for 21pts, missed 37 3’s for a possible 111pts, but all they needed was 6 TWO point shots to win by one? Rockets general manager Daryl Morey: "We should have won tonight. I don't have much else to say." Golden State and Cleveland are the only two franchises in any sport to face each other four straight years in their leagues Championship. Keys for Cleveland to beat Golden State, score 20 or more points in the 4th Quarter while holding Golden State to fewer than 30 points. Control the tempo of play. Why was the he ENTIRE Cavs team not calling timeouts? Why was this not relayed from bench before 2nd FT (in case of a miss)? Why did Lue not headbutt the ref to get his attention? Why did LeBron allow JR to play duck duck goose before signaling for timeout? James is now 1-8 in his career in Game 1 of the NBA Finals (lone win: 2011 vs Mavericks, a series that LeBron and the Heat lost. JR played 19 of 24 2nd half minutes and was a minus-7. In the five minutes he sat, the Cavs were a plus-7. Thirty minutes after the game ended and the Cavs locker room still wasnt open. LeBron James is the only player in NBA history to score or assist on 70 Pts in a Finals game and lose. He's done it on 2 occasions - both against the Warriors (also 2015). Jerry West (twice) and Walt Frazier are the only other players to score or assist on 70 Pts in the Finals. LeBron James is shooting 6-26 (19%) when guarded by Stephen Curry in his Finals career, including 2-5 with a turnover in OT on Thursday. - Assisted on all 5 of their made FG, shooting 5-5 directly off passes (3-3 on 3-pt FG). - Shot 4-4 on uncontested shots while contesting all 9 of Cleveland's shots (2-9 FG). - Held LeBron James to 0-4 FG, all defended by either Curry or Durant. Kevin Durant is 10 of 26 in the 4th quarter since the start of the Western Conference Finals. .....,and it wasn’t even that close! Steph Curry set a Finals record for three-pointers made in a game (9) and now also has the highest lifetime total for threes made in the Finals (90). Ray Allen had the single-game record (8, 2010), and LeBron James had the highest career total (85 after tonight). LeBron James is averaging 34.6 points per game this postseason on a 62.1 TS%. Only one is averaging above 10 points per game. NO NBA team has come back from being down 0-3 in the Finals. Steph Curry is one game away from having as many Championship rings as LeBron James. Kevin Durant was 3-3 on 3-pointers taken from 30+ feet away! KD had 43 points on 23 shots with 13 boards and 7 assist. Cavs got a 30-point triple double from LeBron......it looked like a rough night for him. Pretty devastating scene in the Cavs locker room. LeBron, ice on his knees, feet in an ice bucket, right hand wrapped in ice and a towel over his head is slumped back in his chair. Everyone else quiet with 1000 yard stares. During the four games of the NBA Finals, there were 54 plays that ended with Stephen Curry on LeBron James. Curry held LeBron to 12 points, and the Cavaliers shot 36% as a team on those plays. LeBron James suffered a significant right hand injury after Game 1 when he punched a black board in the locker room, sources report. He had 2 MRIs & has been wearing a soft cast. LeBron not using injury as an excuse but kept quiet to prevent Warriors from knowing. A product of the hand issue? LeBron James recorded an average shot distance of 12.6 feet in Game 1. In Games 2-4, that average dropped to 8.4 feet. Warriors forward David West says there was a lot going on behind the scenes that people will be shocked about when it comes out?????? Barkley, Webber, Grant Hill very critical of LeBron on NBA TV postgame. "He packed it in," Barkley said. Barkley said he intends to "slap the hell" out of any media person who ever again says LeBron is as good as Jordan. LeBron James is now 3-6 in the NBA Finals — and has been swept twice......this his legacy!! While the Rockets are the only team that is close to beat these Warriors. They beat them 5 times this year, all with CP3. They would’ve won Game 7 if he had played. That is both encouraging and oh so frustrating. Warriors in the playoffs since Durant joined the team: 32-6. 2 titles. 28-3 vs all other teams. Tonight the Houston Rockets set a new NBA record with 26 3-pointers made! James Harden is the only player in NBA history to make five or more 3-pointers in eight consecutive games!!!!!!! !